Use this operation to create a horizon at a constant time or depth. Where is the Create Constant Horizon operation? 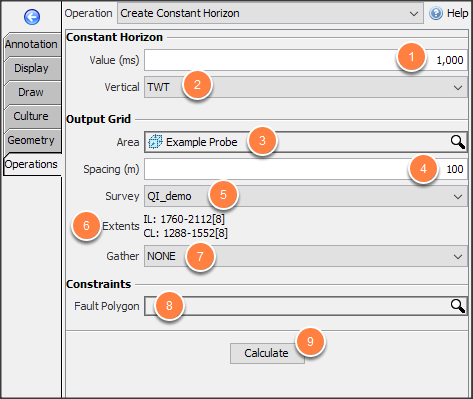 Note: The Calculate button is disabled if the horizon is waiting for another operation (such as propagation). Insight notifies you to complete the previous operation before continuing. Create Constant Horizon is found in the Map View, under the Operations tab (along with other horizon operations). At Operation, select Create Constant Horizon. Enter a Value for the horizon. Select the Vertical dimension to use. At Area, select a polygon/probe to constrain the operation. Enter the Spacing (m) (grid cell size, or increment) for the horizon. Select the Survey to use. Choose <<X/Y>> for a regularly spaced grid without a survey. Extents are calculated from the selected area, survey and spacing. 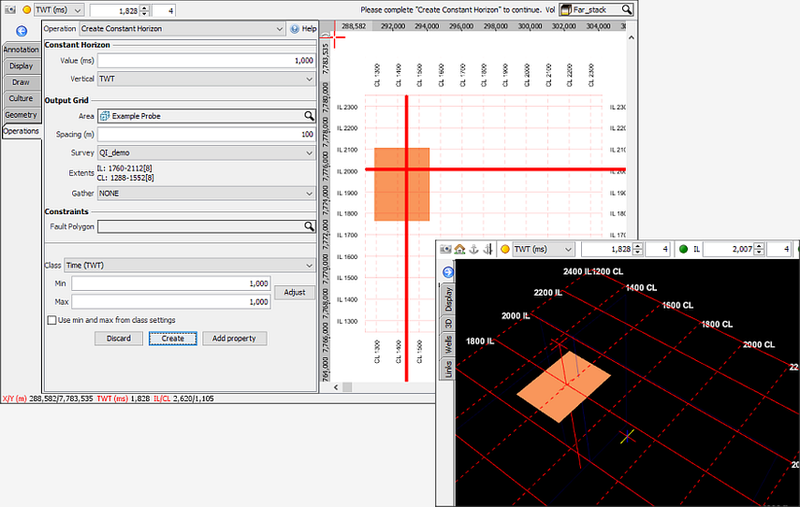 If a 3D survey is selected, the spacing is converted to an IL and CL step size. Optionally, select a Gather dimension and enter the Gather Extents. Select Fault Polygon to prevent the horizon from being created inside the selected fault polygon (see Using Fault Polygons). Click Calculate to start the operation. Note: By default, the new horizon will be named: “constant_value survey/gathers”. For example, the operation above will yield a new horizon called "1,000 ms IL/CL". To rename the horizon, see Horizon Details and Configuration.